Spraying has never been easier for farmer focussed on pasture renovation and small cropping programs than with the new Ranger Grassland 2200. "As its pedigree stems from the Ranger 2500, the new Ranger Grasslands 2200 is a class leading design sprayer utilising the engineering and technology benefits of the higher end Hardi sprayer segments," explained Graham Wilkinson, Hardi Territory Manager and chief protagonist behind the creation of the new sprayer. 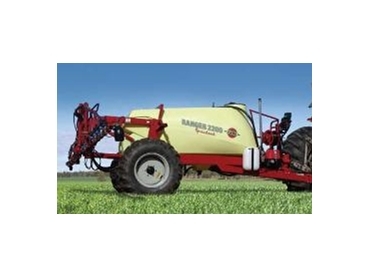 "This sprayer combines proven components with modern style and affordability." Featuring a completely integrated tank and chassis design with a low centre of gravity the Ranger Grassland provides 60 cm of crop clearance. It has a track width adjustment of 1.56 to 2.34 m and boom height control of 0.5 to 1.75 m.
The 2200L tank delivers excellent weight distribution and is designed for effective agitation, even while it is emptying. A foot step with hand rail allows easy access to the platform and tank. It can be configured to suit individual requirements with the addition of automated control, Chem Filler, foam marker and hose reel etc. The optional HC2500 controller is proven computer providing automated function control of application rate regardless of forward speed. Utilising the design features from the bigger Ranger 2500, The Ranger Grassland has the same heavy-duty integrated chassis, drawbar and axle to deliver light weight yet robust construction for long life and performance. The new Ranger Grassland has a fully hydraulic functioning Falcon boom in 12, 15 or 16 metre widths. All is controlled from the comfort of the tractor cab which means no more getting in and out at gateways to fold. The boom design, with trapeze inertia control and coil spring suspension, delivers unsurpassed boom ride in rough conditions. And hydraulic paralift gives fast, effortless boom height control over those obstacles and rock heaps while spraying. Thanks to the well thought out design, options such as the 250 litre flush tank can be seamlessly integrated over the axle without changing the centre of gravity or performance characteristics of the sprayer. The rinse tank allows for quick, easy in-field clean out. Select the optional high capacity ChemFiller hopper for fast, safe mixing and transfer of crop protection materials. A spring loaded drop down bracket allows the hopper to be lowered to the perfect loading height. "The pressure regulation is based on a high speed bypass valve which will arrive at the correct rate quickly. Three sections boom distribution is standard. Individual positive motor drive assemblies control the flow to each boom section. When a section is switched to off, the pressure in the boom line is relieved to tank providing an instant shut-off at the nozzles," said Graham. "They are extremely durable with an enviable history of long life and low maintenance. In the event of power loss each section can operate manually." An optional spot spraying kit for spraying around farm buildings and fence lines can also be used as an external cleaning kit for cleaning external components in the field. This includes 20 metre of 3/8” hose on a reel with a Hardi 60 S hand gun.